The Budo Karate of Mas Oyama, written and illustrated by CAMERON QUINN. We thank the author for his insightful words and reference that we can use. Pictures & descriptions with thanks to students of Shihan Patrick’s dojos. Previously we touched on symbolism behind the junior belts’ colours. Green is first level of the senior colours. The green belt is now more aware of his unique discriminating intelligence and the importance of benevolence and compassion. He would realize that power without wisdom and compassion is destructive, dangerous and callous. Just as Sosai states: strength without justice is violence; justice without strength is impotence. The green belt would, by now have excellence in all his basic techniques, basic movement patterns, and be able to deliver all required kata. He learns to combine his technique with speed and strength that has been developed through hard training. 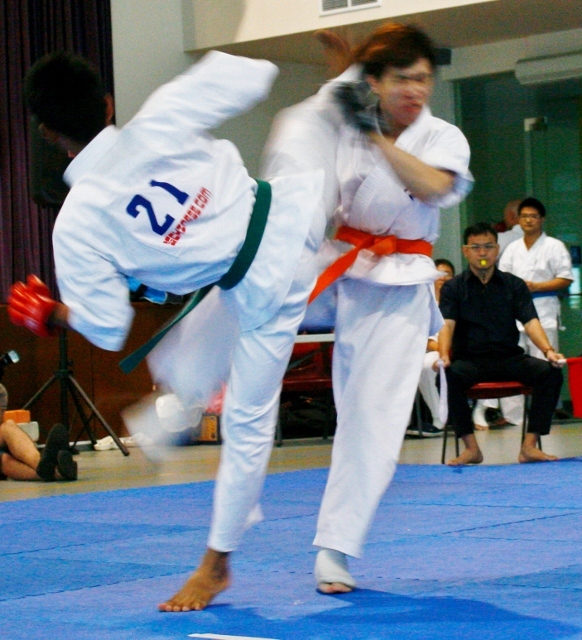 At this level, all green belts should work on the power aspect of karate. Kyokushin is power karate. The green belt should be able to demonstrate this power. Sensitivity and timing- one must learn to feel the opponent’s intentions and balance, and how to time the use of techniques for maximum effect. You should also look into advanced technical concepts and methods; finds personal likes which you will begin to adopt into your own karate. Remember, actions are reflexes, not premeditated moves. A technique happens naturally, without thought. The green belt should have glimpses of the state of mind known as zanshin, where the body acts perfectly without conscious effort. Every green belt should strive to develop a mature and fearless attitude in kumite, while mastering a deceptively calm and unassuming approach to self defence and daily life. This is a very important level in training, which should be undertaken in serious, responsible and mature frame of mind. By now, the brown belt should be very strong and very comfortable in the execution of all techniques, whilst continuing to strive to achieve ever higher levels of skill. In sparring, the ability to control a junior opponent through timing, distance control and sensitivity, should be highly developed. Junior students tend to feel that they can trust the brown belt and the brown belt should respect that trust through honesty, integrity, and loyalty. You must constantly take a step back and look at yourself, make sure you are in control of the personality and the contents and prejudices of the mind; & not vice versa. Every brown belt must brace himself with a brave heart and a will of iron, have faith in the beauty of the unknown that lies ahead. 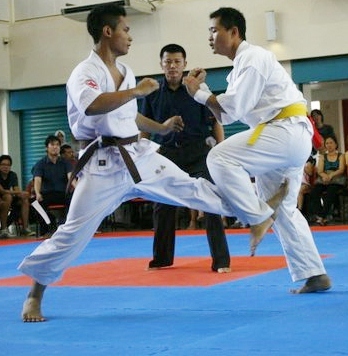 Improvements in own technique are gained through participation in tournaments. Through that, one can then truly see if one’s training has been effective. All too often, the brown belt becomes complacent at brown belt, satisfied with being at the top of the junior grades. Be aware of this and learn to overcome through continuous hard training and moving on to the next belt level. 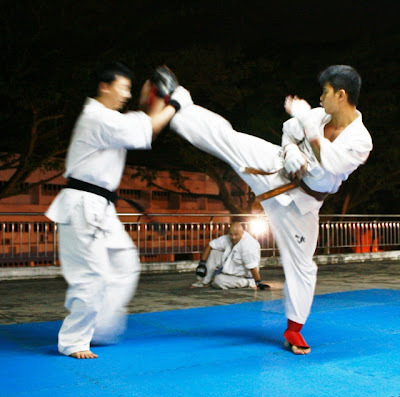 Do not stop your Kyokushin Karate training path here. With thanks to Shihan Patrick for loaning us the book. Posted on February 10, 2012 by admin. This entry was posted in belt colour meaning. Bookmark the permalink.